April is National Poetry Month, so I wanted to make sure that I reviewed a brilliant poetry collection before the month was over. 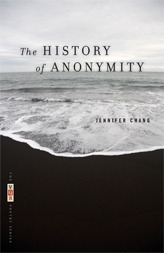 Jennifer Chang is a relatively new poet. She doesn’t have a huge body of work, but what she has out there is spectacular. I have read so many poetry collections that were not at all memorable, but this one has stood out to me since I read it back in 2012. Chang uses references to nature in her poetry in the most exquisite way. Nature is such a huge theme in poetry that it almost always borders on the cliche. So often, I’ve found that poets seem to just describe nature or talk about the beauty of nature. Chang, however, properly utilized nature. The natural references are all metaphors or references to situations or emotions. They have clear meanings beyond just description. Often when I talk about my love of poetry with other people, I am met with blank stares and admissions that most people think poetry doesn’t make any sense. I completely understand how people might feel that way because so much contemporary poetry is deliberately inaccessible with huge amount of ambiguity. This is an example of a collection that can be accessible by everyone! I would highly recommend this collection to both lovers of poetry as well as those skeptical of poetry.